Geek Lit Etc. : Manga Monday: Does everyone have to have crises at the same time? Manga Monday: Does everyone have to have crises at the same time? The trials and tribulations of raising a girl continues - and hits flu season - in Bunny Drop Volume 4. Note: Bunny Drop Volume 4 is, of course, the sequel to Bunny Drop Volume 3. 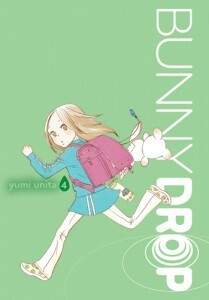 The review of Bunny Drop Volume 1 is here, and the review of Bunny Drop Volume 3 is here. Otherwise, read on! First off, though, we get an impromptu visit from Reina-chan and her mother Haruko. The strain of being the daughter-in-law to an extended family household has taken its toll, and Haruko can't stand it anymore. So she's packed a bag and turned up at Daikichi's house looking for a place to stay. If Daikichi is clueless about children, he really has no idea how to deal with a gal his own age. Even though he can see how it might be hard to do all that work, he has never really been good with women and is hardly able to figure out what to do in this situation. It's also fall, and starting to get really chilly out. Daikichi and Rin got through winter alright last year, but there's a cold going around the school now and Rin's caught it. Daikichi barely has any idea what to do with Rin and takes her to the doctor. He tells them that it's just a stomach bug and sends them home. But Kouki-kun's mother Yukari comes to the rescue, bringing over ice chips and other easy to eat foods for Rin, and helps her feel a lot better. And when Yukari comes down with the same thing, Daikichi, Rin and Kouki-kun head to the grocery to do the same for her. The school's field day is coming up, and it's jump rope time! Rin didn't want to participate at first, since she's terrible at jumping rope, but after Daikichi catches a glimpse of his softening midsection, he teams up with some of the other parents at the park to work on his jump roping, too. Rin's certainly growing up, and Daikichi is growing up alongside her. He's starting to realize that even though you do give up going out drinking with the guys at work everyone he talks to says that it s worth it. he also realizes that he sees the world differently now. He never really interacted with the other fathers at work, and it's nice to be around folks so sympathetic and who have been through a lot of the same things that he is going through. It's good to see a realistic slice of life book that shows grown-ups relating as they really do. Here's hoping that Yumi Unita keeps it up, and doesn't end up pandering to her readers.